Sadness tugs away until it can't be ignored as the fragmented reflections of her soft face in the glass merge with reflective memories of the once-crowded house, now empty save herself. Laughter, fun, and love are all still there with her children (son Alistair and daughter Cheryl), but now distanced by their far-flung college educations. A little pain in her soul, she thinks, but nothing she can't handle. It's 4 am, a classic hour to ask big questions such as 'where is my life going'? Janet decides the answer will come in its own time, in its own way, and goes back to bed. All she knows is that life is not what it could be and she feels pained. Four hours later, Janet is awake again and has already completed her morning meditation. Fingers of incense smoke caressed the air as she tried with all her intention to detach from thoughts of the past or future. But today she can't do it. "Three clients this week!" she thinks. "Only three." "I don't want to lose my lovely home with all its memories"
She loves her house by the ocean. It will soon be warm enough to meditate outside and already she can feel the early spring sunshine tentatively caressing her beachside home with its warmth and radiance. But her mortgage is a necessary evil since she paid her ex-husband, Paul, his share of the home. "It's fine. All I need is 12 to 15 fully paying clients a week and I will have more than enough to pay my increased payment costs." Sandy, her oldest friend, had agreed with loyal alacrity, "Yes, and remember, whatever happens, it was the best thing to split from Paul." Janet hasn't seen Sandy in a while. It's almost as if Janet has been dodging her much-loved pal. "I hate being so obsessed with money"
Clients have been as scarce as positive news headlines and Janet is starting to feel the pain of falling behind in her repayments. She works as a counsellor and does a little Reiki healing, but feels she has lost the sparkle of her early therapy practice. Her money miseries may be the root of this. As she showers and dresses, she wonders why she's been ducking seeing Sandy. Janet admits to herself she feels so worried about money and so achingly separated from her grown children that she feels she'd be no fun for Sandy to be with. "Loneliness begets loneliness," she states aloud to her reflection in the mirror. "Would anyone really want to be with me?" She surveys her 49-year-old face in the mirror. A few laughter lines and her jaw isn't as tightly tucked as it was, but other than that, she feels Old Father Time has handled her pretty decently. Like millions, Janet 'hates Facebook' but spends hours on it. A friend of an ex-boyfriend, Chris, whom she didn't know that well and hadn't seen since her twenties, had...friended? befriended?...her. Turns out he only lives 40 miles away, turns out he still makes her laugh even through a soulless computer, turns out he still looks good - or he's great with Photoshop. Chris had marvelled at how she looked 'absolutely no different' in one of her online pictures, she had girlishly written 'LOL' at this, and he had suggested they meet up. Instinctively, she'd felt that would be fun, but her recent inner doubts and low moods had supplied the recipe for some cooked up excuses. She told Chris she was very busy with work (what a joke!) and he stopped suggesting it pretty quickly. "He must think I'm not interested, but it's he who wouldn't be interested," she thinks, "not in an aging spinster living alone by the sea with no money and kids hundreds of miles away. I'd only make him miserable!" She scolds herself for being so negative and wonders how she became so down on herself and just where her old joie de vivre had gone. "I just can't stop procrastinating"
Janet avoids sorting out her website, procrastinates about organizing her advertising, and dodges other marketing tasks. By lunchtime, she realizes she's done nothing except not do stuff. She even avoids eating and lunch is replaced by a cup of insipid lemon tea. The hours of the afternoon slide along slower than a lethargic snail. She fills her time by focussing on what she ought to have done and what she should do next...but doesn't. Night comes. The icy moon reappears and rises as slowly as her motivation into the evening skies. Janet tries to meditate, but can't; tries to read, but doesn't. As liquid darkness covers the last embers of the day, evening matures into night and Janet decides to turn in. In bed, the whispering worries become shrill screams of panic. She calms herself, but no way is she sleepy. She glances through the window at the watercolour moon. Janet feels pinned down by a bewilderingly heavy sadness. It's going to be a long night. The earth turns its back on the frosty stars to slowly embrace the sun. The black night remains here and there in shadow puddles that seem to melt into light before Janet's eyes. The anaemic moon politely moves aside to let the sun make its tentative entrance. She loves the dawn. Chris is still sleeping in her bed. A happy digital reconnection. To Janet, it seems like they've always known one another from before the sun and the moon and the stars and even before the beginning of Facebook! "I'm so glad I rediscovered my confidence"
She feels warm on the inside and goes back to bed to enjoy the warmth of his body. Six weeks since she accepted his offer of meeting up. Six weeks of recalling old times and living wonderful new ones. Four hours pass and it's proper daytime. Chris has left for work amidst their shared kisses and laughter. Janet sits in the lotus position, so limber and aligned for her 49 years. Incense fills her bedroom, gentle fingers of fragranced smoke massage her mind and release memories of her travels in India twenty years before. As she meditates, memories fade like scented smoke; all expectations are put aside, she feels liberated in an eternal present. "I'd forgotten how important learning is to me"
Showered, breakfasted, and now ready for her first of five clients for the day. Janet had taken a long look at what she needed. 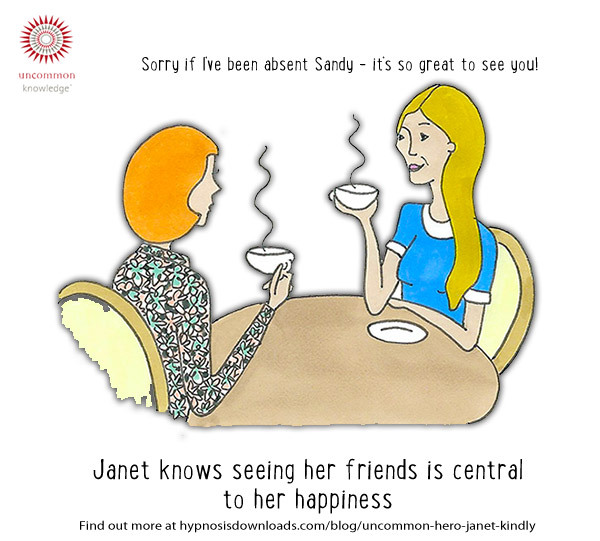 She had shaken up her therapy practice by training in clinical hypnosis and solution-focussed therapy. She's loving it - and so is her business. She feels confident for the first time to truly help people who are phobic, addicted, and traumatized - not just get them to talk, but get them to change! As Janet prepares for her first client, she considers with amazement how she has seen thirty smokers this month already, four traumatized clients, and how she has about a dozen longer-term depressed clients. She is starting to get so booked up, she's considering raising her prices...again. Word of mouth has taken over as her main marketing channel. She feels truly effective and knows that she's really making a difference now. "It's like a blueprint for a happy life"
Janet also learned about the basic, primal needs all humans share and, as well as applying that understanding to her practice in helping her clients, has applied it to herself. She used it as a blueprint to bring herself naturally out of the post-divorce, empty nest syndrome slump. To live with meaning and purpose." Every day, Janet had looked at this list and decided what her life was lacking and took steps to meet the needs as best she could for herself in whatever small ways. "Will agreeing to meet Chris after all these years potentially meet one or more of these needs?" she'd asked herself. And when she considered that, yes it would, she'd agreed to meet him. Does seeing her friend Sandy and other friends meet one or more of these needs? Yes. Does learning self-hypnosis and therapeutic hypnosis for her clients help her meet one or more of these needs? Yes. So she had. It was so clear and simple, but the results of focussing on her needs and using them as a guide to help her and her clients were huge. Janet is a believer that life sends you what you need. But she also understands that the universe or what some call 'God' helps those who help themselves. As her doorbell tells her that the first client is here, it occurs to Janet it will soon be warm enough to see clients on the secluded beachfront balcony. The thought produces a kind of inner spray of happy sparks and she opens the door with a warm smile. Her day is challenging, intriguing, and wonderfully rewarding. 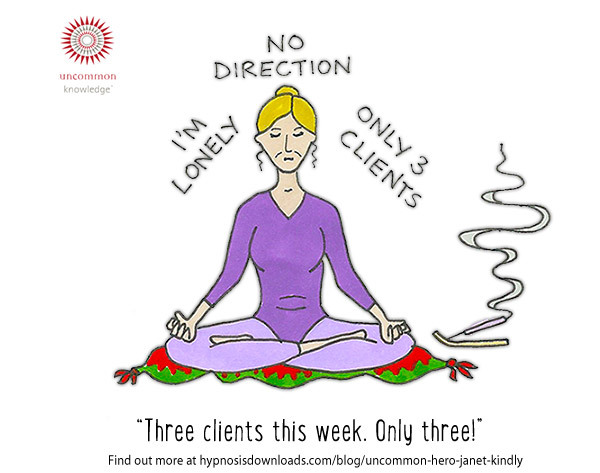 She takes 15 minutes to meditate and clear her mind after the final client has left. This evening, she'll Skype with her son, Alistair. She is no fan of technology, but feels she has and does use it to help meet her and others' needs. Cheryl, her daughter, will be coming to stay in a week and the thought is such a happy one. "I can't wait to discover what the future holds"
Janet enjoys a light supper. She and Chris are talking about going away and she takes an hour to explore possible options online before switching off and diving into her moonlit sea of words. She has finally started writing her novel. She's been toying with the idea for decades. Janet finds she just loves the doing of it and the outcome can take care of itself. As she wades, splashes, and enjoys the eddies and flows of the great ocean of her plot and the company and intrigues of her characters, great puddles of shadow appear outside and soon the world turns modestly away from the sun toward the stars of the night. Janet barely notices.